Craving something down-home and Southern for breakfast? Check out these old-school diners and local hot spots in Raleigh, N.C., to find gigantic pancakes, buttery biscuits and gravy, country ham, grits and more for breakfast (and some for brunch!). Also, look out for places that put creative twists on Southern classics! Located at the North Carolina State Farmer&apos;s Market, the State Farmer&apos;s Market Restaurant offers country cookin&apos; at it&apos;s finest. Upon walking into the restaurant, you&apos;ll be greeted by smiling hosts wearing overalls. Biscuits will soon arrive on your table once you&apos;re seated and peruse the menu. The Granny Cone Sampler is a must if you&apos;re hungry, and includes two eggs any style, sausage, bacon, N.C. country ham, sausage gravy, spiced apples, three silver dollar pancakes, home fries or grits and toast or biscuits. There&apos;s no wonder a sign out front of the restaurant reads, "Y&apos;all come back now!" Located beside train tracks in the town of Garner, Toot-N-Tell Family Restaurant offers Southern-style home cooking. This no-fuss restaurant has been around since the 1940s and offers your typical breakfast featuring home fries, eggs and your choice of meat. Toot-N-Tell opens at 5:30am for all of you early risers, too! Sure, it might seem like a hole-in-the-wall restaurant from the road, but Pam&apos;s Farmhouse is an institution. 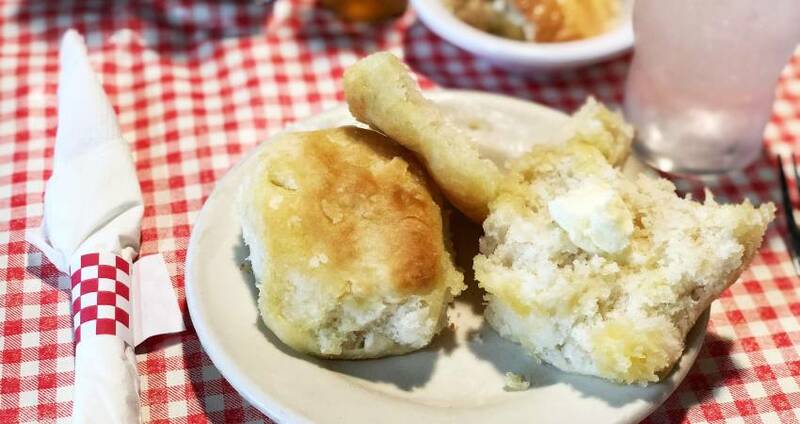 A staple at Pam&apos;s Farmhouse is the sausage gravy paired with two fluffy, fatback biscuits. You&apos;ll enjoy the laid-back atmosphere and your waitress is guaranteed to be as sweet as Southern iced tea! Watkins Grill is a down-to-earth Raleigh institution serving generous portions. The walls are adorned with interesting license plates, portraits and other Southern-themed antiques. The hobo eggs are a crowd favorite, which include a large portion of scrambled eggs with a meat of your choice. The toast is commonly referred to as "just magical" by locals, probably because it&apos;s slathered with butter and is perfectly crispy. Don&apos;t forget to bring cash! A trip to the town of Rolesville isn&apos;t complete without a stop at Rolesville Diner. Breakfast is served all day, and the three-egg omelets are popular picks. If you&apos;re craving something a little sweeter for breakfast, try the French toast with powdered sugar and syrup or the blueberry or chocolate chip pancakes. You&apos;ll definitely feel like you&apos;re a part of the family at Rolesville Diner, located on the quaint S. Main St. Serving traditional Southern breakfast in Garner, Angie&apos;s Restaurant is a popular breakfast spot with locals. Breakfast is served all day and you can expect to find traditional egg platters served with hashbrowns or grits, choice of meat and biscuits or toast. With the tagline "A Taste of Friendship," Angie&apos;s offers great service, and you&apos;ll be leaving with a smile and happy belly. A downtown Raleigh institution, Mecca has been serving breakfast since 1930. This old-timey diner is known for serving Southern comfort food in the heart of the City of Oaks. The most popular breakfast items include made-from-scratch biscuits and the Western omelet. Located in the town of Apex, Dallas Famous Chicken specializes in well, chicken, and Our State magazine included their fried chicken biscuit in its bucket list of 42 must-try Carolina chicken joints. Order one at the counter! This laid-back, rustic restaurant is adorned with decor ranging from deer heads to country antiques. If you feel like sharing, Dallas Famous Chicken even offers a dozen biscuits to go. Opened in 1988 in North Raleigh, this local favorite offers an extensive breakfast and brunch selection, including a new omelet, Benedict and griddle special every month! Check out the griddle combos with two eggs, any style, plus a side (go Southern and get grits, corned beef hash or country ham), or take advantage of the $6.49 weekday breakfast specials. Brigs serves up their popular eats all over the destination with locations in North Raleigh (the original! ), Maynard Crossing and Tryon Village in Cary and Wake Forest. One of James Beard Award-winning chef Ashley Christensen&apos;s restaurants, Beasley&apos;s Chicken + Honey knows their fried chicken. A line is usually wrapped around the corner on weekends, but this restaurant is definitely worth the wait. Chicken biscuits and fried chicken and waffles are the brunch staples. Go ahead and pour N.C. honey on your waffle, too. NOFO @ the Pig is a unique Southern cafe, gourmet market and gift shop located in a former Piggly Wiggly supermarket. Located in Raleigh&apos;s Five Points, this restaurant offers a delicious weekend brunch. The shrimp and grits are outstanding and include sautéed shrimp, smoked bacon, sliced mushrooms, garlic and scallions over pepper jack grits. What could possibly make this dish even better? Biscuits served on the side, of course! Relish Craft Kitchen & Bourbon Bar&apos;s brunch menu focuses on offering comfort foods with a new Southern twist. One of the stars of the menu is the pimento cheese and bacon biscuit. It sounds simple enough but, wow, it&apos;s super delicious. Choose the fried green tomatoes or cheese grits for your side. Rooted in the Carolina mountains, Tupelo Honey&apos;s Cameron Village location in the City of Oaks offers an exceptional brunch featuring a revival of Southern food and traditions. The banana pudding layered pancakes are a must!